Control arms are analog to the way a person's own cartilage helps to hold their bones together and keep the separate components of their skeleton from rubbing against each other, which would cause damage. In terms of a Slingshot's suspension, the control arm lives up to it's namesake by allowing the driver to better control their Slingshot. This is because the control arms hold the knuckles, spindles and axles in place, keeping everything together by acting as a pivot point between the wheels of a Slingshot and the rest of the vehicle. 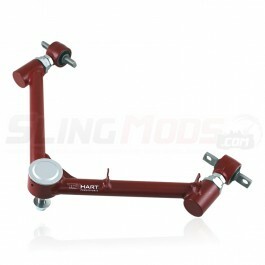 Typically a control arm is built with a ball joint that allows it to rotate as the Slingshot moves over obstacles or takes turns. This means that the suspension is able to move up and down without damaging its parts or allowing the Slingshot to fly out of control. This lends to a much smoother drive for it's occupants with better handling for all aspects related to steering.